His skills were mesmerizing. I knew that Choy Li Fut’s stances were deeply rooted, and his stances were indeed low and strong, but I was impressed by how he could manoeuvre from strong and secure positions to positions supposedly far beyond his centre of equilibrium, and do so effortlessly with complete control over his speed. I had a chance to witness another performance of the same form, just last year, at a celebration of martial arts at the National Air Force Museum of Canada organized by Sensei/Sifu Greg Magwood www.magwoodsmartialarts.webs.com Drunken Style is athletically demanding and some of the postures can amount to pure contortionism, which, I thought, would make it a young person’s game. But here was Sifu Joe, decades later, rolling on the hard floor. He was as precise and as masterly self-controlled as he had been back when I first saw him perform. An important point to remember – there is no one Drunken Style per se. The concept, and the type of training involved, can be found in various Chinese martial arts from Choy Li Fut to Monkey Kung Fu. In most of these traditions, students are exposed to Drunken Style forms only at a more advanced level. Before we begin with an analysis of Drunken Style, please be assured that every part of every traditional form you may ever see is deeply rooted in combat. A finger attack to acupoint TW 17 appears in a form because of someone’s past survival experience; a sudden kick to the inside of an opponent’s knee is there because an attacker’s knee snapped during a fight and the Choy Li Fut practitioner was able to escape. That simple. And that complex. All traditional martial arts start with a foundation (stance work; rootedness; breathing; focus; unifying the mind, body and spirit, etc.). Next comes movement, wherein we learn to carry that rootedness from one step to the next. Once we can do that, we begin to work with a partner , one step at a time. We then continue on to free style movement, wherein we’re expected to use techniques freely and an impromptu manner…all built upon our initial foundation. What Drunken Style does is to extend that foundational training to boundaries that are extreme. For the traditionalist, the dantien (the area below the navel) holds the centre of balance and power. We operate from that core, even while sparring. Drunken Style, like Ba Gua, attempts to reach as far away from that core stability while maintaining contact with the tandien. 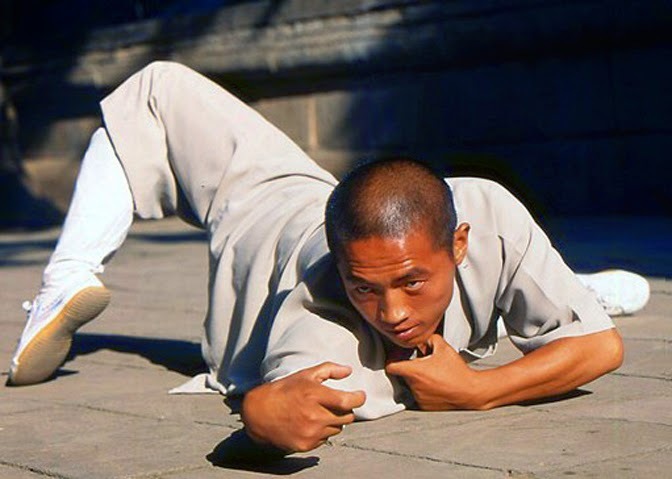 At an advanced level, martial art practises like Drunken Style or the advanced Wudang systems create secondary tandien, storing and releasing power from various parts of the body while remaining fully rooted. For real combat: realistic fighting capability 360 degrees at all levels extended to the most extreme body postures. You’re ready for anything. When first training in Karate, I learned to move smoothly in various stances up and down the floor. “Don’t bop your head up and down…roll your hips into the stance…grip the floor…breathe deep into the dantien!” the instructor said. It’s a thing of beauty to watch a Judoka transition from one attempt at a throw immediately to another without losing her balance or her timing. 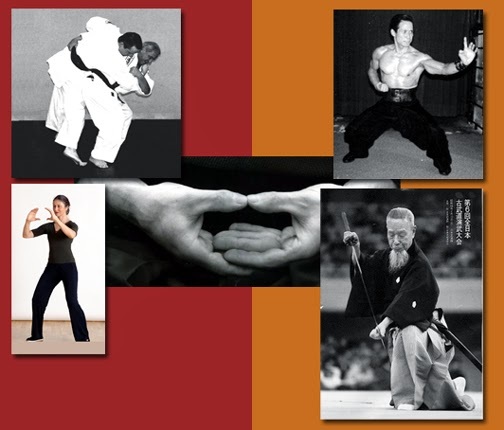 Tai Chi, Aikido, Silat…smooth transitioning is a hallmark of martial root. Drunken Style will cobble together all manner of transitions… stumbling or falling…while still maintaining the same degree of control. For real combat: your ability to adjust smoothly to all changes in the field of combat remains – forgive the pun – unimpaired. The idea that wine pours through the chi meridians is a meditation practise used – you guessed it – at first in stationary chi gung, then moving chi kung. Wine fills, and lots of wine fills heavily. The quality of internal energy, of the heavy variety so desirable in iron hand training, spreads through every inch of the body while the body itself remains relaxed. For real combat: ammunition is stored in every part of the body. Most Karate Kata contain variations of fast and slow movements. At a superficial level, slow movements add a nice contrast to bursts of more rapid movements especially if you want your fast movements to look really fast. However, if you watch someone like Higaonna Sensei on YouTube, you’ll notice a host of “old school” training concepts during his Kata’s slower movements. 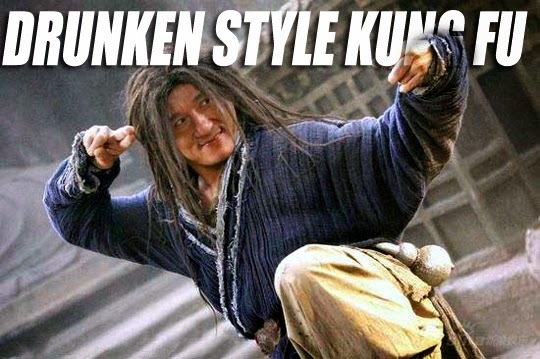 Drunken Style understands that chi flows in coordination with the body at different speeds (as does Chen Tai Chi). Drunken Style also looks to control every inch of a transition, sometimes at very slow speeds. Advanced martial artists also use their slowest movements to replenish their power. For real combat: learning to reload at various speeds (and that’s just one example). For martial arts to fully prepare its practitioners for “war” (martial art = war art), a training regimen that practises the widest possible elements of combat – terrain situations, timing, weapons, psychological factors, multiple attackers, etc. allows its practitioners to prepare as much as possible for the real thing. Fighting rhythm is an element of combat Drunken Style explores. For real combat: there is no one rhythm to a combat situation. You must explore them all. In the Hakka Kung Fu systems, you “swallow” and then you “spit” the power out. There isn’t a Tai Chi system that ignores explosive power. Drunken Style works at developing explosive power from seemingly uncoordinated platforms. For real combat: lethal power, with or without weapons. Lightness, and the ability to relax, is absolutely necessary for the extreme mobility demanded by Drunken Style. The heaviness, which I touched on in Energy Like Wine, is essential for iron hand power. Both qualities combined lead to a powerful system of self defense. For real combat: efficiency without wasting power. Taekwondo’s kicks – so fast and powerful – can come in from any direction in a split second; the great knife fighters from the Philippines and Indonesia are as nimble in their strategies as they are in their movements; the fighting system My Jong Law Horn remains true to its “labyrinthine” roots. The unpredictable fighter is difficult to defend against. Drunken Style thrives on unpredictability. The opponent’s senses become intoxicated with an overload of wrong information. In Drunken Style, the body is hardened both specifically and overall through abrupt falls to the floor. This is on top of the usual iron body conditioning. Remember Matsuhashi Sensei’s comments about remaining calm in the recent series of posts by Douglas Tong. Traditionalists all strive for a state of absolute calm during the storm of combat. We meditate, and we train for “no mind”. No matter what a Drunken Stylist’s exterior portrays, the core of her mind remains calm. A mind locked on one thing, one emotion, one target, remains stiff; a mind that remains unlocked is open to all possibilities...at very high speed. For real combat: less chance of a mistake, relaxed alertness…and after combat subsides, the ability to transition smoothly back into a state of peacefulness. Of course, practising a Drunken Style form won’t necessarily mean that you’ve become a “war art” fighter. Many people practise for pure enjoyment. Others practise for performance. Some more punning – Drunken Style can keep you fit and healthy. And for the serious fighter, Drunken Style is really worth investigating.